AoA iPod Transfer provides a fast and easy way to transfer music and video files between your computer and iPod / iPhone.AoA iPod Transfer is the easiest solution for you! With just one click, you can easily transfer music and videos from the PC to iPod/iPhone.Easily copy your entrie iPhone / iPod media (audios, videos) to your computer with just one click!Transfer your music and videos from your computer to the iPod / iPhone with just one click. Copy your videos and musics between iPod and computer. Copy music and videos from the iPod / iPhone back to your computer. Batch transferring available. Easily copy your entrie iPhone / iPod media (audios, videos) to your computer with just one click! Transfer your music and videos from your computer to the iPod / iPhone with just one clickd. Batch transferring available. Getting access to your iPhone's file system. You can browse your iPhone's files, drag and drop stuff onto it. 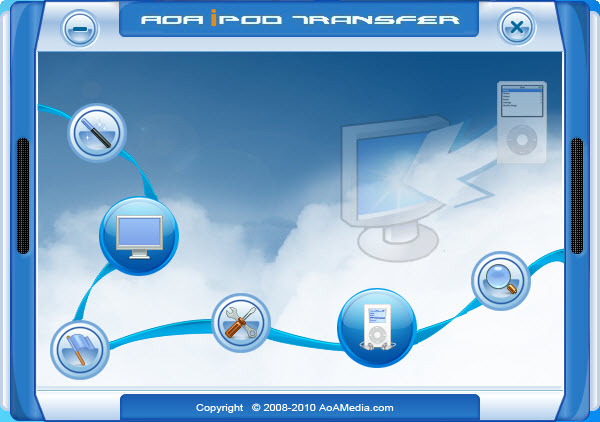 AoA iPod Transfer makes it simple to edit track information on media files, rename playlists, transfer media into a playlist, or delete files and playlists directly from your iPod/iPhone. Qweas is providing links to AoA iPod Transfer 1.6.0 as a courtesy, and makes no representations regarding AoA iPod Transfer or any other applications or any information related thereto. Any questions, complaints or claims regarding this application AoA iPod Transfer 1.6.0 must be directed to the appropriate software vendor. You may click the publisher link of AoA iPod Transfer on the top of this page to get more details about the vendor.